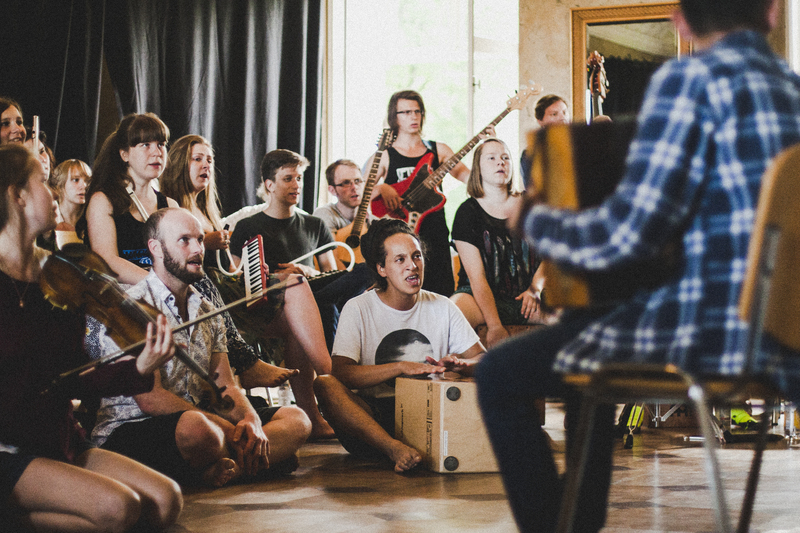 23rd Estonian ETHNO - a camp for young folk music friends - calls for musicians aged 16-30. The camp takes place on 16-28th July in Kõpu Manor, Viljandi County. Registration for Kids ETHNO, a camp for younger musicians, is also open. At the Estonian ETHNO camp, participants have a chance to learn traditional music from different countries. The workshops are led by the youngsters themselves and the learning is done by ear. Every day, 3-4 participants share a tune or a song with others, the tunes are arranged together and later performed at concerts. The idea is to give young musicians a taste of different music cultures and create a network of musicians from around the world. The whole process of workshops and learning is supported by the organizers, artistic leaders and volunteers of the camp. Kids ETHNO takes place on 20-25th July. The camp, held for the 4th time, brings together children aged 10-16, who are skilled instrument players and have an interest for traditional music, but don’t quite make it to the big ETHNO camp yet. At Kids ETHNO, they can learn old songs, dances and tunes, take part in collective workshops filled with singing and playing, meet exciting special guests, enjoy dance workshops, bonfire nights, handicrafts and a visit to the Estonian ETHNO camp. While the participants of Estonian ETHNO camp share and learn tunes from different countries, the main focus at Kids ETHNO is on Estonian traditional music. Margit Kuhi, the chief of ETHNO camps, is always so glad for all the children and youngsters who come to the camp. “Their creativity, cheerfulness, openness and playing skills are admirable. They leave the camp with strong emotions and broader mindset, they find new companions, get new creative impulses and inspiration for their future life and music choices. ETHNO camp is truly a life-changing experience for many participants. Who has has had the taste of it, will always want to return!” she says. The very first ETHNO camp took place in 1990 in Sweden, Dalarna. Today, ETHNO camps are held in very different places all around the world. The camps are coordinated by the organization Jeunesses Musicales International (JMI), of which Estonian ETHNO is also a member.